A current favorite game is playing empty the clean clothes out of the laundry basket. 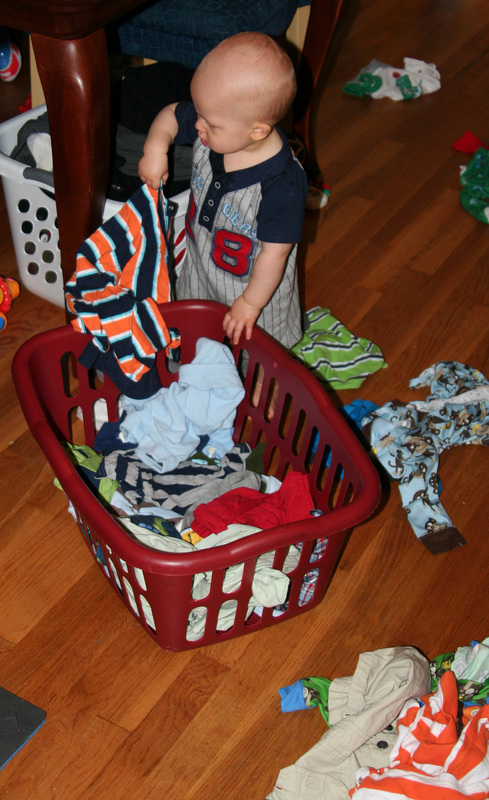 I do a lot of laundry and most of the time there is a basket or two of clothes waiting to be folded and put away. 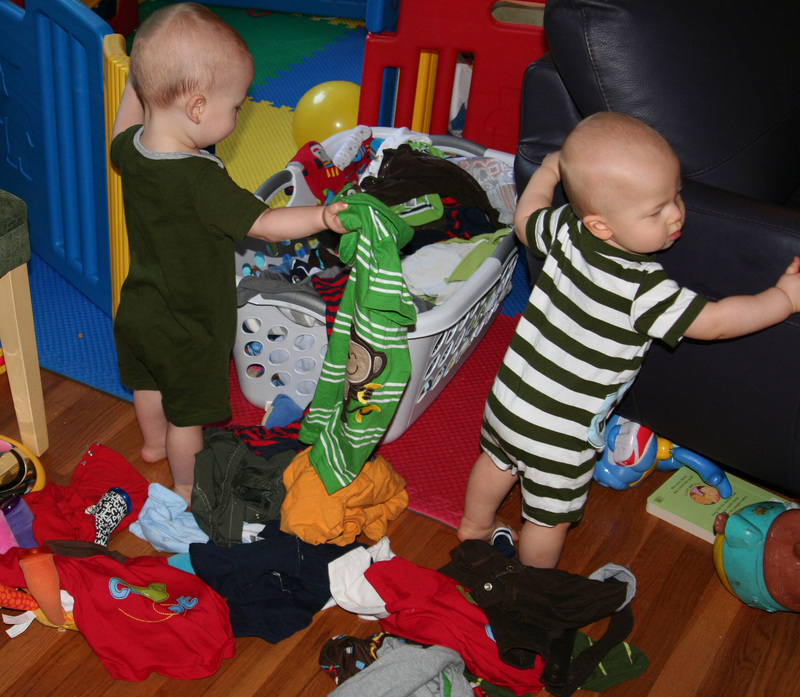 And usually I just leave Ruslan and Wyatt’s clothes in the living room because that is where I get them dressed in the morning and a bedtime. 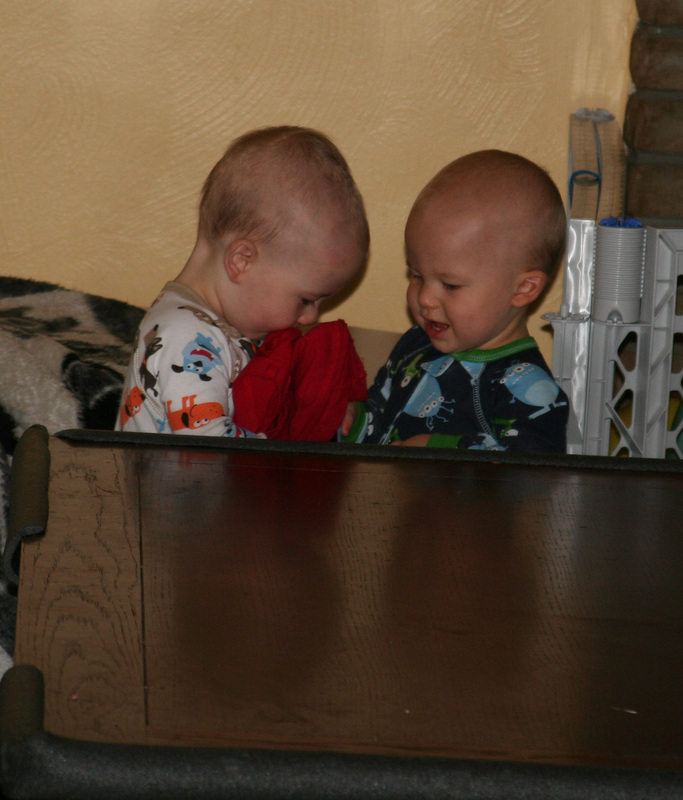 My morning already consists of (1) go upstairs to get Wyatt, carry him downstairs and get him settled with his milk, (2) go upstairs to get Ruslan, carry him downstairs and get him settled with his milk, (3) go upstairs and convince Juliana that she really needs to wake up and get dressed and brush her teeth and then give her a piggy-back downstairs; and hope that we didn’t forget shoes or something else that she needs for the day. 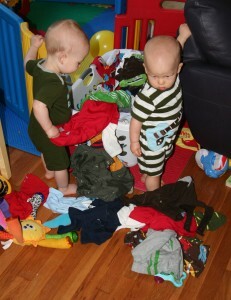 I am not interested in adding any more trips up and down the stairs in the morning to get the boys dressed upstairs. 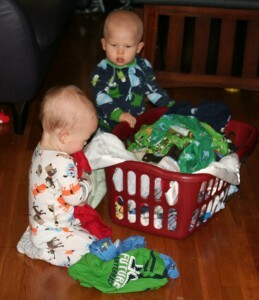 And carrying all of their clean clothes upstairs when they get dressed downstairs…that would be silly. 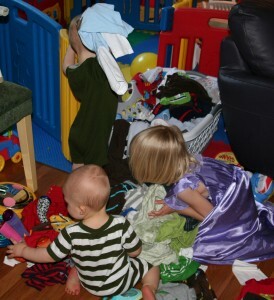 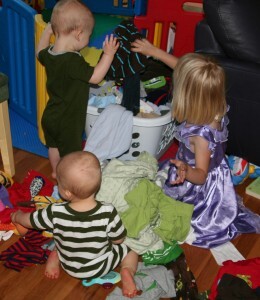 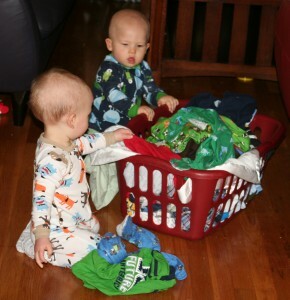 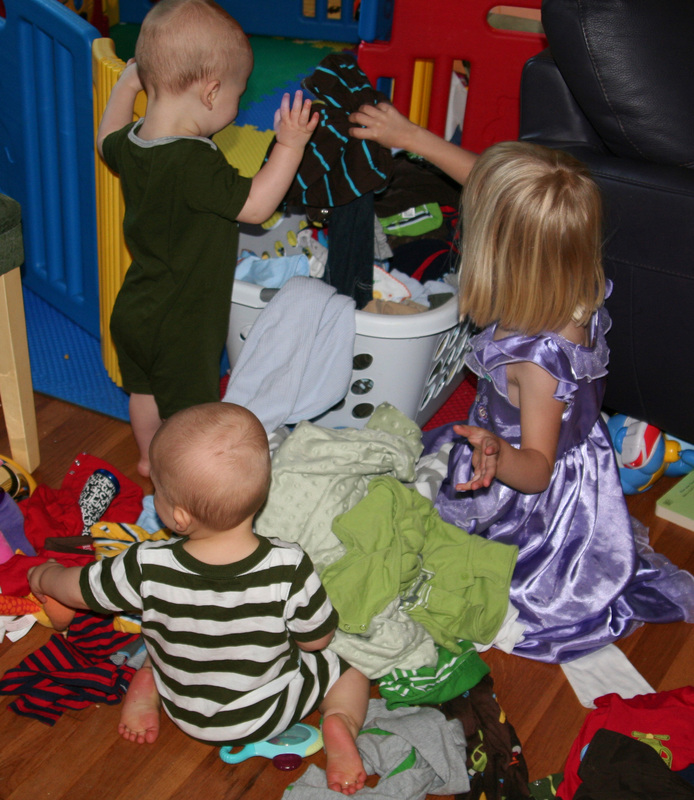 Usually the empty the basket game consists of a short-lived frenzy – clothes tossed out of the basket and then they move on to other adventures. 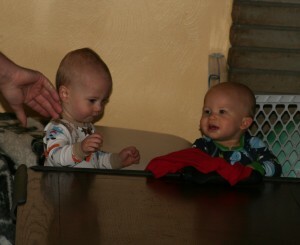 On this occasion, Ruslan and Wyatt were making their way through the clothes when Wyatt took special interest in a shirt he spotted. 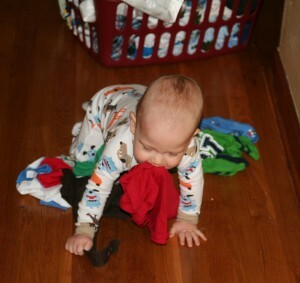 He grabbed it in his mouth and escaped the area. 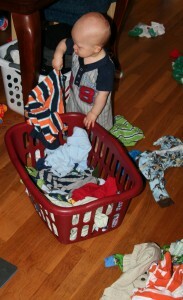 Then he noticed that Ruslan had found and absconded with the most prized possession in the house – the remote for the TV. 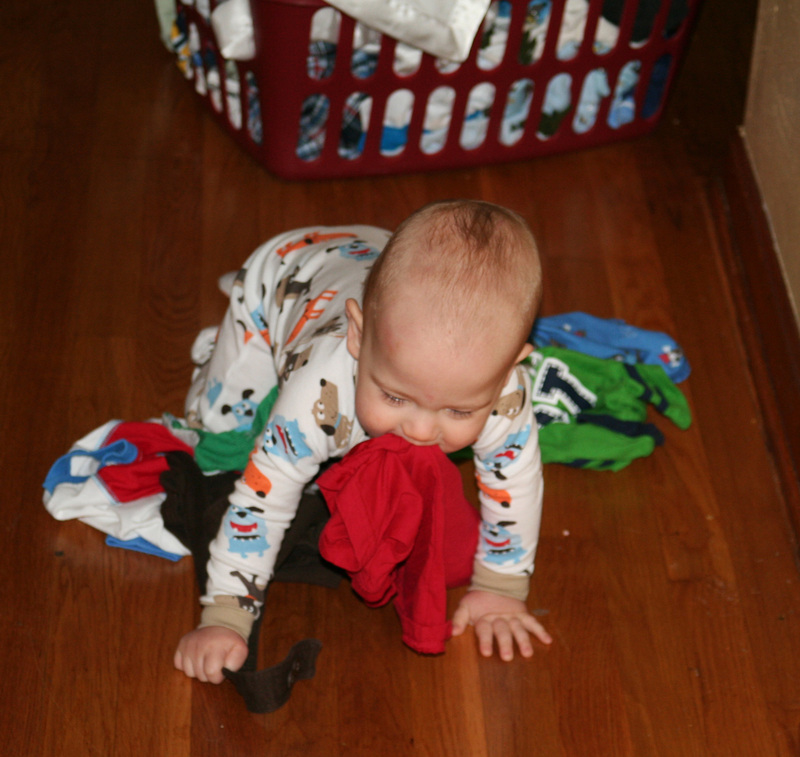 He raced across the room, shirt in mouth, and caught up to Ruslan. There was a scuffle and Ruslan ended up with both the remote and the shirt. 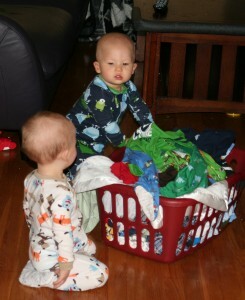 And moments later the remote was returned to higher ground and the laundry was put back in the basket.